Shelter Logic has figured it out! 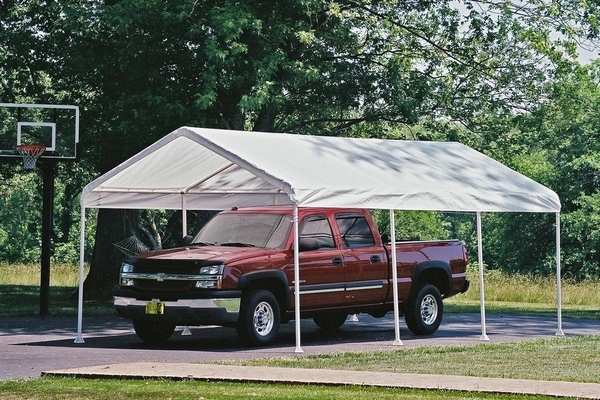 This 12 Foot by 20 Foot Super Max Commercial Grade Canopy Shelter stands strong on 8 Legs with Wide based foot pads. Featuring welded 2" diameter steel tested to stand up against most extreme weather conditions, the frame has undergone Shelter Logic's 13 step Rhino Shield surface prep process, has been bonded with DuPont(tm) thermoset powder-coated finish eliminating worries about rust, weathering, chipping, or peeling. Legs Twist-Tite(tm) to create maximum tension and taut fabric. Use included temporary spike anchors and SL Bungee cords to secure legs. Then make sure everything's square with their Easy-Slide Cross Rail(tm) system clamps. Cover is one piece, heat bonded with three layer of polyethylene enhanced weave for 100% waterproofing, and both sides have been treated for UV protection, anti-fading and anit-fungus. 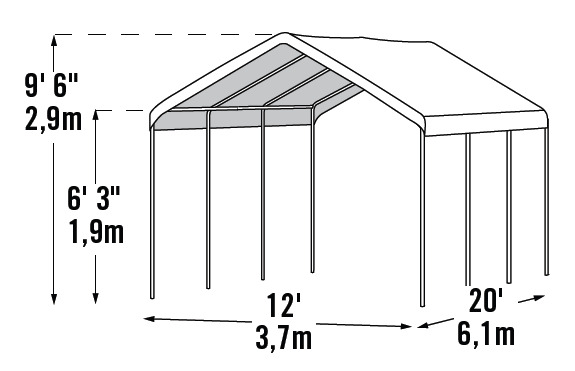 Now totally resistant to tears, the Shelter Logic Commercial Grade Canopy can be expected to last 10 years. Easy to put together & secure to ground. I use it to keep my hay sheltered. It was definitely more than a one man job to put it together. ProsIt appears to be made well and pretty sturdy, especially after anchoring it down properly. ConsIt needed better anchors instead of these straight stakes. Also, it would be easier to put together and hold better if each joint were joined with pin.